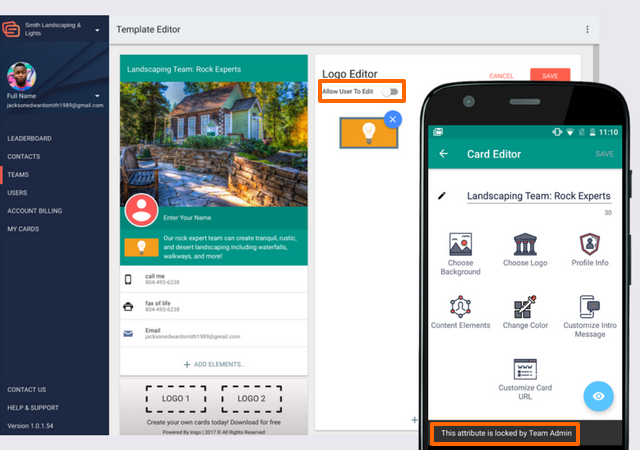 As an Inigo Team owner, you are able to "lock" options on a team template to keep your team members' cards consistent. 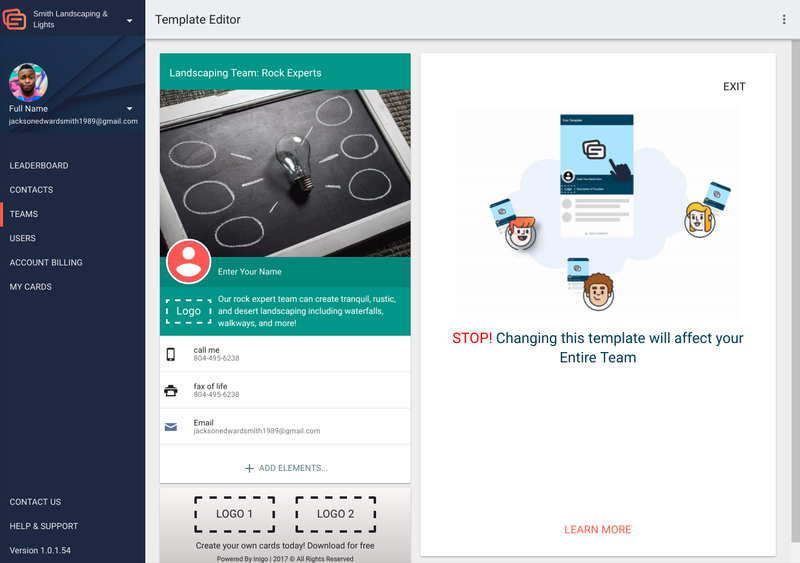 You can create locked features on any template, whether it is in your main team or sub-team. Card users can still add their own contact information, name, and title. 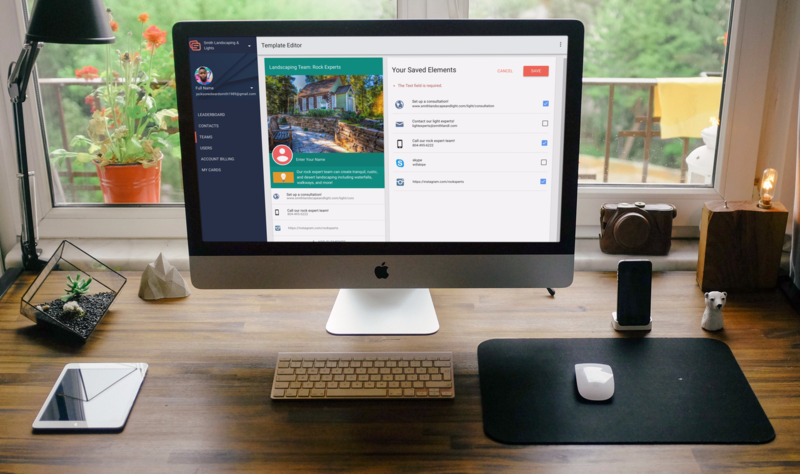 However, if you are trying to keep cards consistent and recognizable with specific background images and titles, this may be the best option for you. TIP: Remember to sync your Inigo App for these features to come into effect. To do this, click the three dots in the top right-hand corner of the cards page, and hit sync. If you would like more information on creating awesome card templates, please read this article. To edit a template, please go to the appropriate team or sub-team folder. Double click on the template to open the template editor. This should look familiar to what we've seen before when we created templates, except all of your changes will be saved. 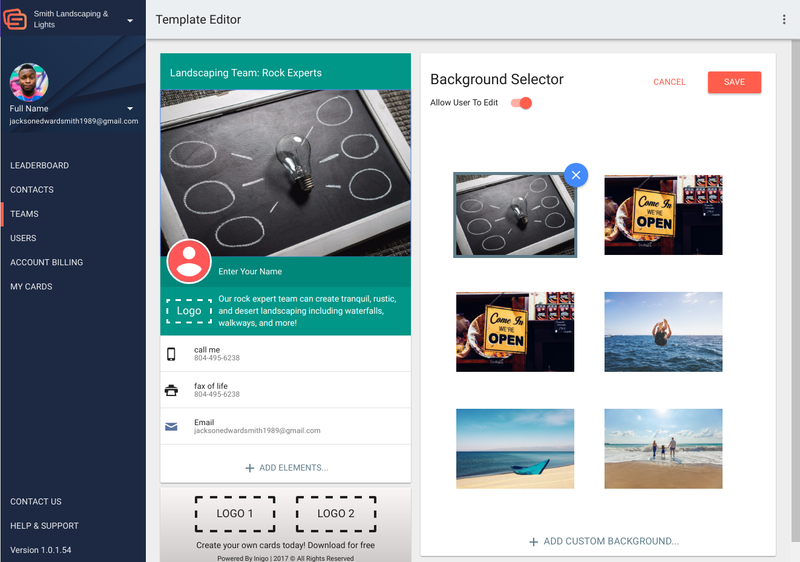 If you are creating a new template, you can still create fixed features. Select the template title to open the text editor on the right. 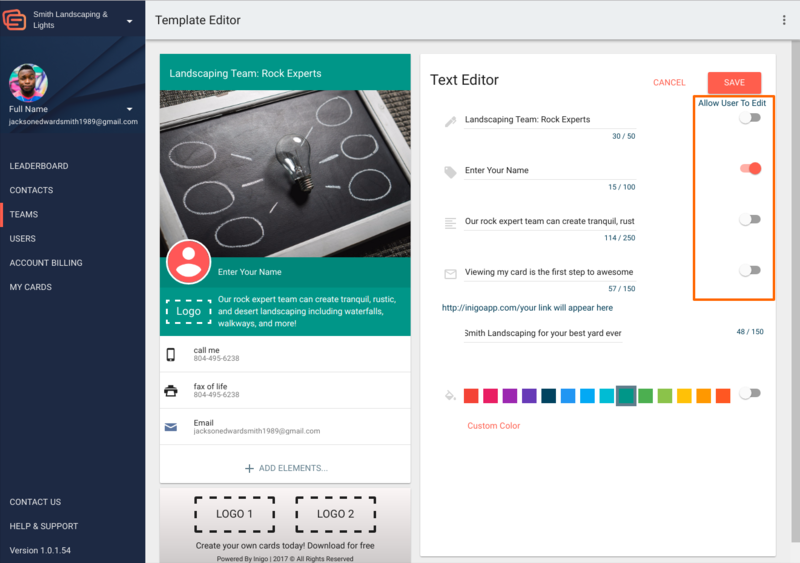 You can also edit the description, user name, template color, and greeting message. Notice that I have created a template title to signify that this card is for the Rock Experts portion of this team. If this was in the Rock Experts sub-team, I could differentiate it even more, like "movers" or "builders." I have also chosen a specific color, as well as written a description and greeting message. To lock these features, I am going to hit the toggle switch under "Allow user to edit." Hit the switch so that they are not highlighted and click "save." Now these features will be locked on this template. You can also lock the image used for the background. To do this, click the background image on the template. 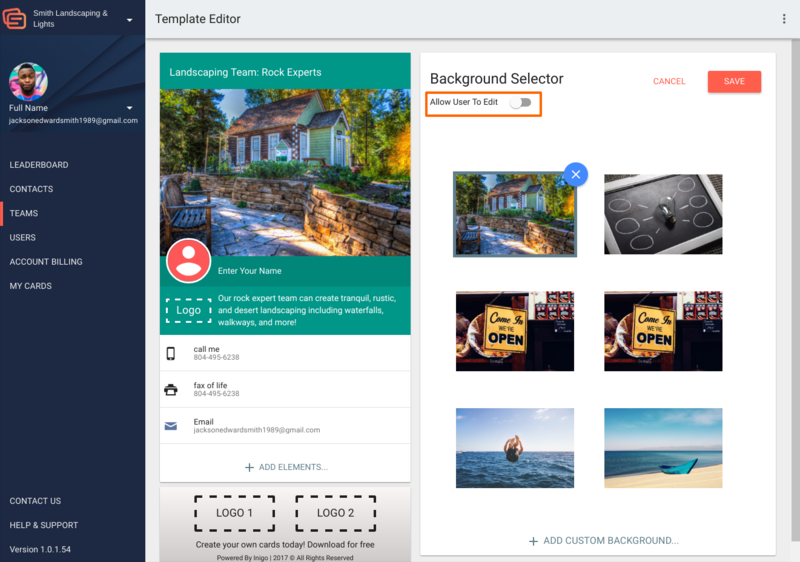 If you would like to upload a custom image for your template, please read this guide. 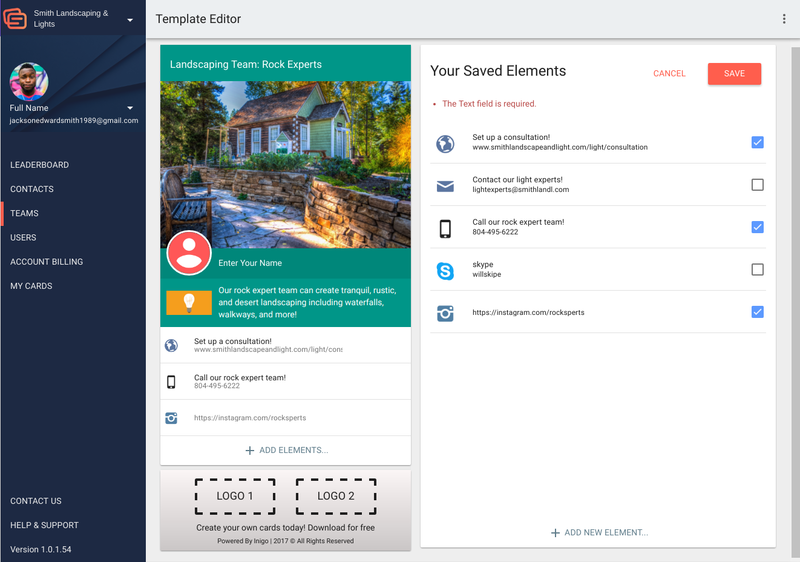 Add or select a template that you like for this template, and click the toggle next to "Allow user to edit." Now the background image will be locked on this template. 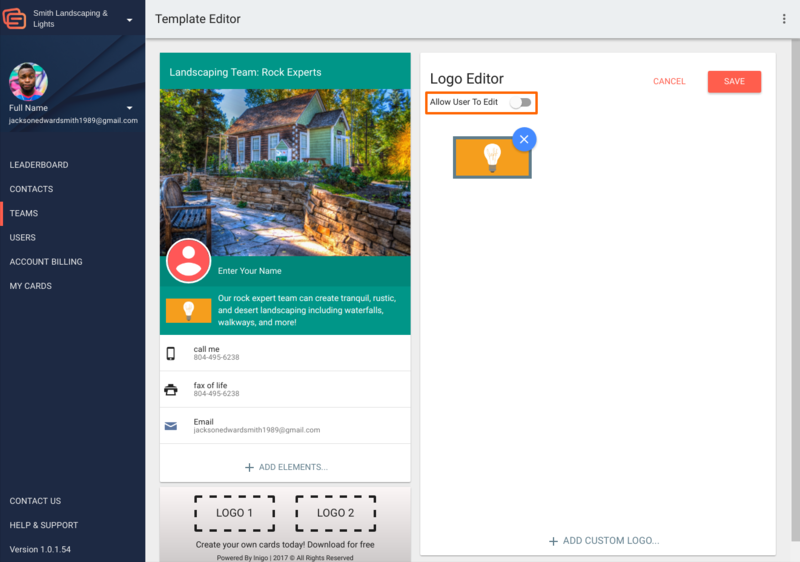 You definitely want to make sure that all of your team members are operating under the same logo, so make them all look great by locking in the correct one the first time! To do this, click the logo image in the template editor. If you are adding a logo for the first time, please view this video. Once you upload the appropriate logo, click the toggle next to "allow user to edit" and click save. Now the image will be locked. Your team members will still be able to see the text and images that you have locked on their cards in the app and in Inigo team. They will not be able to edit these elements and will receive a message telling them this when they attempt to. Other elements that are not fixed can still be edited normally. At this time, you cannot lock certain elements on a template. 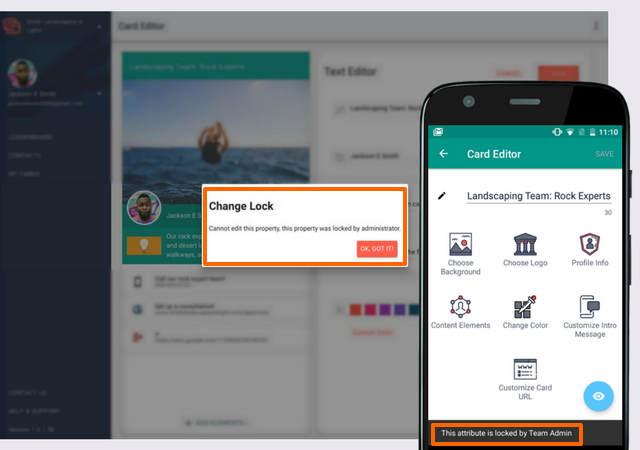 However, if you add elements to a template, they will appear for the team members when they access the template to create their cards. This can be a quick and easy way to regulate certain URLs, addresses, phone numbers, and other company assets to help your users set up their cards quickly, and to eliminate errors. To do this, add elements to the card template before you save it. Be certain to not add any personal elements, as these will be shared with the template to all of your team members.